... and set a new record. It's always fun to see the performance capabilities of electric vehicles, and we haven't yet tired of watching Teslas go up against supercars, street racers, even airplanes, win or lose. DragTimes fed the world another Tesla drag race video this week, pitting a Tesla Model X P100D with Ludicrous+ against a Lamborghini Aventador SV powered by a 6.5-liter V12 (and worth $530,000) in a quarter-mile challenge at Palm Beach International Raceway. The Model X gets a better start off the line, and ends up finishing just 0.05 seconds ahead of the Lamborghini (which was quickly catching up at the end). 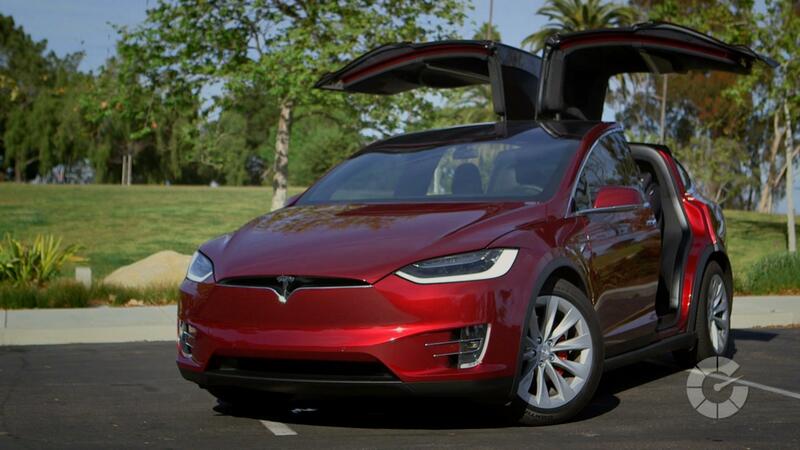 While the Lamborghini was technically faster (with an elapsed time of 11.281 seconds and a speed of 129.38 miles per hour), the Model X finished the quarter mile in 11.418 seconds at 117.95 miles per hour, which DragTimes notes is a world record for an SUV. The difference in the sound between the two vehicles is striking, as we find from the separate camera views. The Lamborghini absolutely screams, while the Tesla just whistles in the wind a bit. After the Model X, the Lamborghini takes on a Model S P100D. It almost looks like the Aventador jumps the gun a bit (but it doesn't get a red light, and shows a reaction time of just .008 seconds with some well-timed wheel spin), and ends up finishing 0.15 seconds ahead of the Model S. The Tesla's elapsed time was 10.947 seconds at 119.71 mph, while the Lamborghini's ET was 11.164 seconds at 129.08 mph. These races showcase the mighty acceleration of the P100D Teslas. While the traditionally powered supercar is faster at the high end, the low-end shove of the EVs prove them to be great drag cars, even weighing over 5,000 pounds.